Brazil's Evangelicals A Growing Force In Prayer, Politics : Parallels In Brazil, evangelical Christians have made inroads into the Catholic community with innovations like drive-through prayer centers and massive outreach fairs featuring popular pastors and pop stars. In a nation long dominated by Catholics, about 22 percent of Brazilians now identify as evangelical. 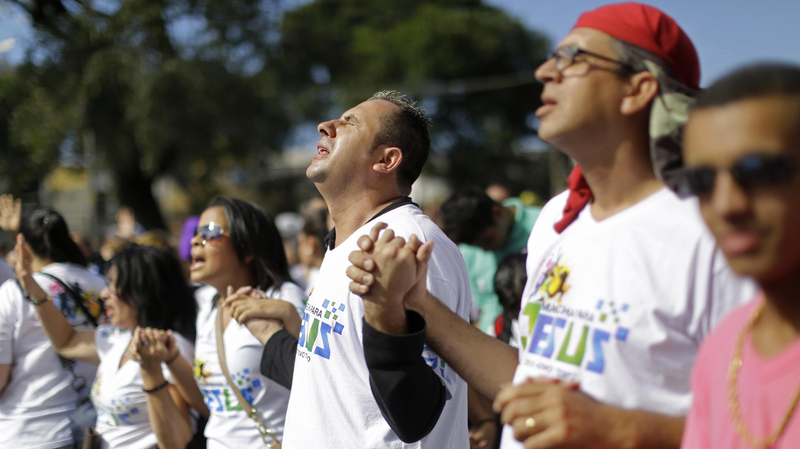 Evangelical Christians pray during the "March for Jesus" in Sao Paulo, Brazil, Saturday, June 29, 2013. In advance of the pope's visit, evangelical Christians held a rival gathering at Sao Paulo's convention center. It was massive event, with more than 200 stalls scattered around and thousands of visitors over the past few days. Christianity in Brazil is big business — not only are major superstar pastors represented at the convention, but businesses like Sony Music have booths as well. Brothers Lucas and Renault Lourenço have been singing together since they were in their teens, and together they are the Brazilian evangelical version of the boy band. Now in their early 20s — sporting matching faux hawks and wearing jeans — they came to reach out to their established fans and sell records to new ones. "This fair attracts many people, even people who are not evangelicals, which is essential because that way people will know the gospel and so every day there will be even more of us evangelicals," Renault says. And, in fact, there are more every day. Recent polls show that evangelical Christianity is the fastest-growing sect in Brazil. According to the Pew Research Center, 22 percent of the Brazilian population identifies as evangelical Christian — up from 5 percent in 1970. Unfortunately for the Catholic Church, most of them switched from Roman Catholicism. These days, only about 65 percent of people in Brazil say they are Catholic. In absolute numbers, however, this still makes Brazil the country with the most Catholics in the world. Natalia Andrande says events like this attract new followers, and she says that's her message to Pope Francis. "This is a way of showing we are strong, that we are also the church," 15-year-old Andrande says. "It's a way of changing people's minds." Evangelical groups, and there are many, have also translated their numbers into a growing political clout. While the Catholic clergy are prohibited from being in government, President Dilma Rousseff has an evangelical bishop as a Cabinet minister. Despite the pope's imminent visit, Rousseff prayed and reportedly sang with an evangelical group that recently came to lend her support. That's the reason analysts say that evangelical churches have grown so big and so fast: They reach out to people on many levels and are visible in politics. But they also have, for example, drive-through prayer centers for busy commuters or rehab centers for the dispossessed. One small center is called Cristolandia, and it's located right in the center of what is known as "Crack-landia" in Sao Paulo. The congregants are mostly drug addicts and prostitutes. They come to get a free meal and, if they want, eventually treatment for their addictions at evangelical rehab centers located in the countryside. "I was a Catholic, but the church lost its sense of solidarity with the poor, with the drug addicts, with the prostitutes, the murderers and the thieves," says Cristolandia Pastor Humberto Machado. "The church closed its doors to these people." And that's why he says Catholicism has been losing favor. This week Pope Francis will be visiting a shanty town in Rio. He is already being touted as the "slum pope," in reference to his focus on social justice and poverty. But it will take a lot to gain back some of the ceded ground. While there is only one church in the community he will be visiting, there are four Pentecostal temples. In the audio of this story, as in a previous Web version, we incorrectly cite Pew Research Center statistics. In fact, 65 percent — not 62 percent — of people in Brazil say they are Catholic.